I had a comment left by my buddy at MSU, Paul, and I decided to answer it here instead of the comments. Here's the comment to start with. This corn thing is all hype to drive down the prices we get for our calves this year. After processing the corn in the ethanol plants, approximately 70% of processed corn is left over and can be fed to cattle. This "mash" will begin to pile up and I would think that this should become cheap feed for feedlot operations. This should result in the movement of feedlots from Texas to Nebraska, Dakotas, Iowa, etc. Will this happen, this remains to be seen. This should be good for Montana calves. When I was a kid during the '50's we fed "mash" from the beer breweries to the milk cows. This was cheap fed and lasted until the beer companies moved out. It seems to me that some folks are just out to make a buck at the expense of anybody. I am looking forward to good calf prices this year. We sell on Superior every year and usually get top dollar for our calves. It is all a matter of timing. I would like to hear your comments on this "mash" issue which nobody is talking about. Short of the feedlots being very close to the ethanol plants, someone is going to have to find a way to process this "mash" into pellets or something so that it can be shipped. Obviously the closer the better, hence watch for more feedlots in the North. This corn thing is all hype to drive down calf prices? I don't think so. There is real pressure on the corn markets with the rise in the ethanol business. This cannot be denied. I personally think that the market is a little over speculated, to many people betting the market will go higher yet, and there are some indications that this is true. I heard a report on the radio that the year end corn stocks were significantly higher than expected and they were thinking that ethanol wasn't sucking up as much corn as people thought. I personally think that other users of corn, mostly the livestock industry, are finding ways to do with out as much corn since the prices are higher, the law of supply and demand doing its thing, and that is why there is more corn left than expected. Now what Paul means by "70% of processed corn is left over," I am not exactly sure. I do know that when they are done making ethanol they have distillers grain, mash as Paul puts it, left over. Distillers grain can be fed very efficiently to cattle but not so to hogs and poultry. Since we can feed corn to cattle hogs and poultry very easily, there has to be something significantly different about distillers grain since it is so hard to feed to hogs and poultry. Therefore distillers grain is not 70% corn, and I'm not sure it has 70% of the feed value of corn so I'm not sure what Paul means. Distillers grain is a wet product that does not conduct itself to long distance transportation. There are a few plants that make Dry Distillers Grain which is, as the name indicates, distillers grain that is dried so it is a dry product. This dry product is easily transported and shipped using existing transportation assets unlike distillers grain. 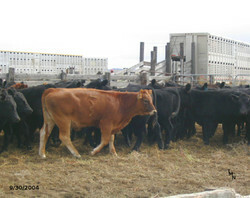 Since distillers grain is so easily feed able to cattle, that is where most of it is going. The problem here is most of the big cattle feeding areas are not in the same area as the corn producing areas where ethanol is being produced. The question becomes, what is going to happen to the distillers grain? I've heard reports but have been unable to prove them that there has been some effort in Iowa, a big ethanol state, to open up new cattle feedlots since there is not much cattle feeding in Iowa anymore, mostly hogs are fed there now. The problem is that the Iowa Department of Environmental Quality will not approve of any new cattle feedlots to be built. This leads to a growing distillers grain problems in Iowa and other states. Will we see more cattle feeding going on in Northern states as Paul speculates? I personally don't think we will see any large movement of feeding back to northern states. They will either figure out how to ship distillers grain to where it can be used or they will start drying more of it and shipping it out. The advantages of feeding where they do now far out weigh the distillers grain issue. Hell, it wouldn't surprise me if the mounting problem of distillers grain drives more ethanol plants to the feeding states and they will ship corn into them as cheaper than trying to deal with the distillers grain in the northern states. My opinion but who knows. This whole corn price issue has yet to shake out. How it will ultimately affect not only the livestock industry, but most of the food production in the US has yet to be figured out. There are a lot of experts throwing out predictions but it's a lot of hot air. Hindsight is 20/20. We will know once the system has finally stabilized from tall the shocks going through the system now. Hell, who would have predicted with higher corn prices, calf prices would stay as good as they have? Nobody predicted that but now that we see the trends it makes sense to us. Beef demand is staying strong, feeders aren't feeding as much corn to get the critters to fat and are slaughtering the cattle at lighter weights but still maintaining there profitability. This has led to a demand for calves that I would have never expected with corn prices as high as they are. The market is making adjustments and figuring things out. That's all you can ask for. It's not hype out to screw the cow-calf man out of money, it's the market at work, like it or lump it. So in short, I disagree with Paul that some mysterious entity is driving corn prices up to get calves cheaper. I also disagree with him that there will be a large movement of cattle feeding to northern states because of the "mash" from ethanol production. There might be a slight movement but nothing big, the market will find a way to efficiently handle the distillers grain issue if the government doesn't intrude and muck it up. I take a neutral view on the distillers grain being "70% of processed corn is left over" since I just don't know what the nutritional value of distillers grain is. I see where a lot of research is going into how to efficiently feed distillers grain but I am not conversant with it. The only statement he has that I agree with is " I am looking forward to good calf prices this year. " I don't expect it to be quite as good as last year but they will maintain themselves well and an efficient producer will be able to make a little money if Mother Nature will just cooperate a little. I hope you enjoyed my answers Paul. I've tried to cover all the bases but I may have left something out.